PBOT plans call for a transit median island in this location with the bikeway running (curbside) behind it. 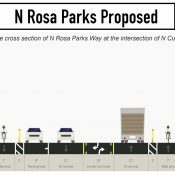 The redesign of North Rosa Parks Way now includes a bike-only signal, wider bikeways (and narrower lanes for driving), a safer crossing, and a floating transit island. 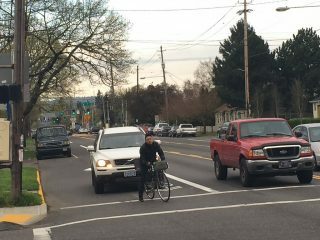 These changes (and a few other tweaks) have been made in the month since the Portland Bureau of Transportation first launched the project back in February. 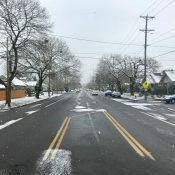 This key neighborhood collector street will see major striping changes from North Willamette to Martin Luther King Jr. Blvd. 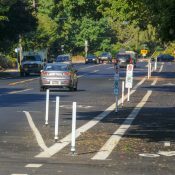 The biggest change is a “parking-protected bikeway” (almost) the entire length of the project — and a buffer stripe with intermittent plastic delineator wands for added protection separation. 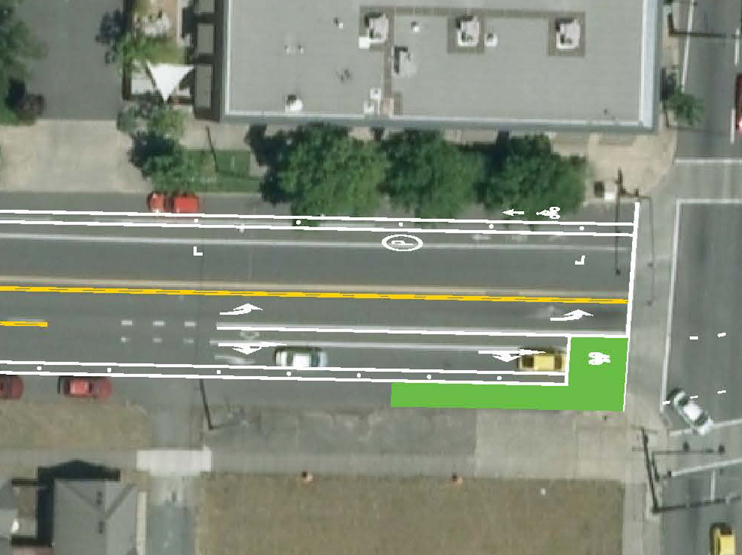 Instead of on-street parking, PBOT will use the curb lane for a bike-only lane. In the process, PBOT will significantly decrease the amount of parking overall. Between N Willamette and Curtis. Between Curtis and Greeley, the big addition since last month is a new crossing at Villard that will come with two median islands and zebra-striped crosswalks. They’ve also added an additional stripe in the westbound lane at Atlantic that will further narrow the standard lane and help slow people down. One of the biggest updates is a new bike-only signal at eastbound Greeley. 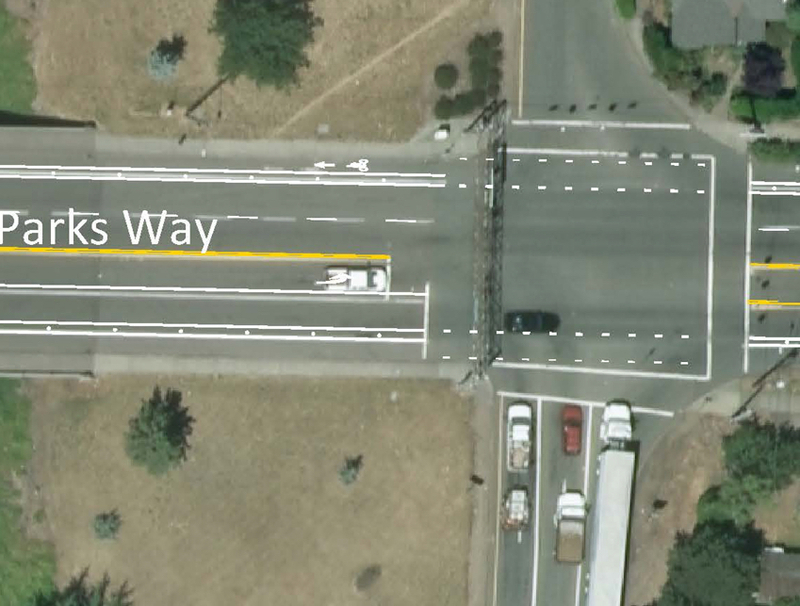 This is being done to end the threat of right-hooks at a very high-volume right-turn only lane (Greeley is a major connector to I-5). There’s not much change (beyond the parking-protected bikeway) from Greeley to Delaware; and I think that’s where they left off last month. Now the’ve released the striping plan all the way east to MLK. Besides the bike-lane for parking-lane swap, the new striping from Delaware to Denver largely follows the existing striping. Note that in this five block section, PBOT will no longer allow on-street parking on the south side of the street. And on the north side of the street, the space where parking is still allowed will have been significantly reduced. Same goes on the section from Denver to Interstate. At Interstate, Rosa Parks will remain at five standard lanes — four for through traffic and a left turn lane. This is a wide profile for a neighborhood street and it’s relatively stressful to bike here. 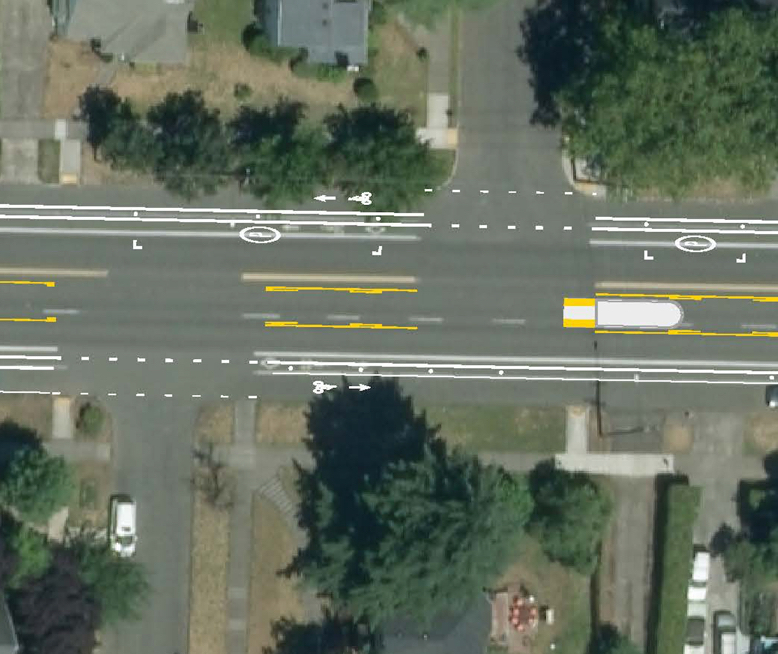 This project will add green coloring to the bike lane (eastbound only as shown), a buffer stripe, and a few intermittent plastic wands. Without more substantial physical separation and/or without reducing capacity for auto users, this intersection is likely to remain dangerous and high-stress for bike users. As we head east from Interstate toward I-5, the lane profiles stay similar to what we have today (remember that the Oregon Department of Transportation controls the lane designs approaching and crossing their freeways) with the addition of a buffer stripe and plastic wands to protect separate the bikeway. 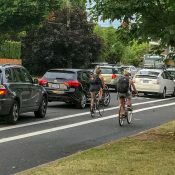 That should help the cycling environment, but it’s impact will be limited as long as driving is the dominant activity — and as long as PBOT isn’t able to redesign ODOT’s on-ramps and off-ramps. With their obscenely wide turning radii, the type of driving these on-ramps encourage has a vast negative impact on our community. At eastern on-off-ramps to the I-5 freeway. East of I-5, the removal of nearly all on-street parking between Michigan and Albina (Peninsula Park) will improve visibility while trying to cross Rosa Parks. However, without the presence of cars, I wonder if this project will result in safer and slower driving behaviors. 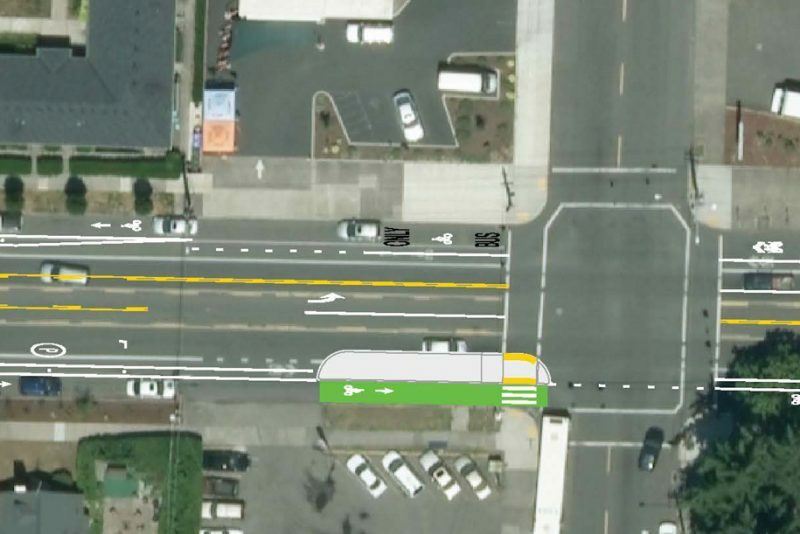 At Albina, PBOT is proposing a floating transit island with a green-colored bikeway that will run behind it. This would be an excellent improvement that will make that corner much better. From Albina heading east, the bikeway continues to have a buffer and plastic wands. At the off-set intersection of Rodney (a popular north-south route), the plans call for a median island. The last notable feature of the current plan is a green bike box at the southwest corner of Rosa Parks and MLK. We’ve heard from members of the Piedmont Neighborhood Association that PBOT plans to remove an existing curb extension at this corner. They are very concerned because a 70-family affordable housing development is coming to that corner and they feel like subtracting sidewalk space is a bad idea. 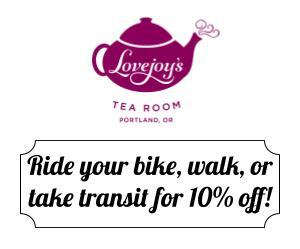 We’ve asked PBOT about this but haven’t heard back yet. NE Martin Luther King Jr.
To see all the updated design drawings and more about this project, visit PBOT’s website. I have yet to see a green bike box in Portland that was not paired with a “no turn on red” sign. Count on it being implied here. It doesn’t show a green box, though. A bike box is a bike box, is it not? Great! How about separating Williams/Vancouver? And Broadway/Weidler? I think plans are still in place to move the bike lane to the left on Vancouver. Mr Maus, can you confirm if that is still going to happen or has it been put on hold? Is there any reason other than cost that only one floating bus stop is proposed? It looks like there is sufficient width at a number of other bus stop locations. This is dreamy. Thanks PBOT!. Can’t wait to use these new safer facilities. 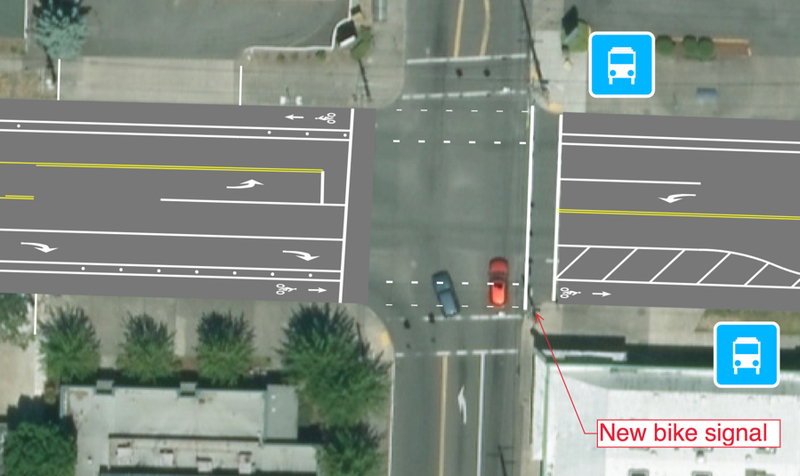 Genuinely curious–how would the transit island on N Albina improve conditions? From first glance, it seems that pushing bikes further to the right at a corner would create more of a blind corner for drivers. I rarely encounter these islands when riding so I’d like to learn more about them. They are relatively new to Portland so we’ll have to see how it goes. But my hunch is it will work. The presence of the median will effectively narrow the driving space and cause people to slow down. The median will also increase the difficulty of that right turn for drivers — which will make them more cautious and safer as a result. And keep in mind that the median is just a curb — I don’t think it will create any visual impairment for drivers or bikers. Agree, I think the biggest benefit will be that it’s going to create a pretty tight turning radius for vehicles taking a right on Albina which will slow not only vehicles turning right- but also all the vehicles behind them as the car in front slows to make that turn. My experience with them is that they’re really good. The first one installed here had people worried but it’s turned out okay. Putting the bike lane to the right improves visibility (if done right) as the driver will have turned and can then see someone cycling. In fact, the bike lane should go even more to the right than they have here. In fact, why not make it a protected intersection? 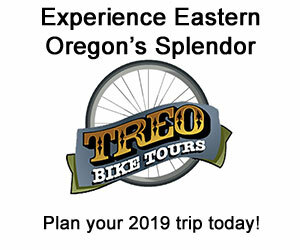 You’ll be have more ability to experience them in Portland soon. 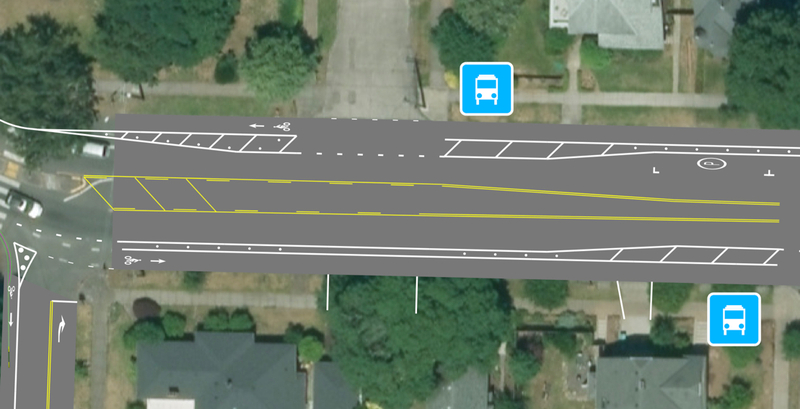 This year PBOT will be installing floating bus stops on NW Front Ave and on NE Halsey St.
As someone who lives within a block of that intersection I think it’s an interesting idea. There is a large electrical box on on that side of the block where this is going in. It completely obscures the view of pedestrians waiting to cross South to North. As a pedestrian (or occasionally cyclist) who uses that crosswalk to get to the park it feels like a driver could make a half hearted stop and take a quick right and kill me. It’ll be a welcome change to have to look for a much slower moving bike than a car who just came off the freeway. I live 3 blocks from the Rosa Parks/Interstate Ave intersection and drive/bike it just about every day. I see a lot of dangerous behavior from drivers going both directions, mostly causing scary situations on the west portion of the intersection. People heading east will fully use and block the bike lane so that they can turn right at Interstate Ave. The more scary thing I see is cars racing off the line when heading west after the light has turned green. People in the right lane will try to get in front of cars in the left lane before the lanes merge, often swerving into the bike lane at high speed and accelerating. I don’t see any changes introduced that would affect what I see from drivers at this intersection, which is too bad. Other than that, I like the changes. I live a couple houses from Rosa Parks and this will definitely impact/reduce available parking for me in front of my home, but I’m ok with that. I live in a city and don’t own the space on the street in front. The added bicycle infrastructure is a plus and well worth the inconvenience to parking. instead of west of Interstate. buffer space and wands are helpful, but not ‘protection’. Parked cars are less permeable, but only when present. ‘Protection’ varies by degrees, like filters, from zero to near 100%. Separated, buffered, delineated, parking protected (part time), protected. Even a curbed island is permeable to those driving too fast. Only when the majority of errant autos are prevented from entering a bike lane is that bike lane ‘protected’. oh I get that paikiala… i just don’t take time to edit that word choice all the time. But since I agree w/ you that it’s important to be accurate on this.. I’ve now edited the story, adding quotes around “protected” and swapping “protection” for “separation” in a few spots. I don’t even consider parking-flanked bike lanes “protected”, for a number of reasons. There’s nothing stopping a person driving a car from using the bike lane to orient their car into the spot without backing up. And the mid-block driveways (see SW 2nd ave) are a perennial source of concern and conflict. Add that to the number of large vehicles that obscure visibility to your presence and you have some real issues. I actually feel less safe(and I am, by the numbers) in these types of lanes than I do in a traffic-adjacent lane. Source your numbers, please. These are not 2-way bike lanes. Some welcome improvements. Almost got doored yesterday right after Willamette turning onto Rosa. The scariest part of Rosa is still Interstate, and not because of Interstate but because of people trying to get into New Seasons. New Seasons is really talented at making dangerous traffic situations with their parking lots. I have to agree with Mr. Kreps on the parking protected lanes. I frequently surprise people on Broadway at PSU who wander into the path while waiting to cross Broadway or getting out of the passenger side of a car, despite my heavy use of my bike bell. Also, I almost got hit by a car turning at the last light. They did not see me on the other side of the parked cars from them. Fortunately I was watching them and was able to take evasive action. All I lost was a fair amount of rubber off my back tire. Much improved design. 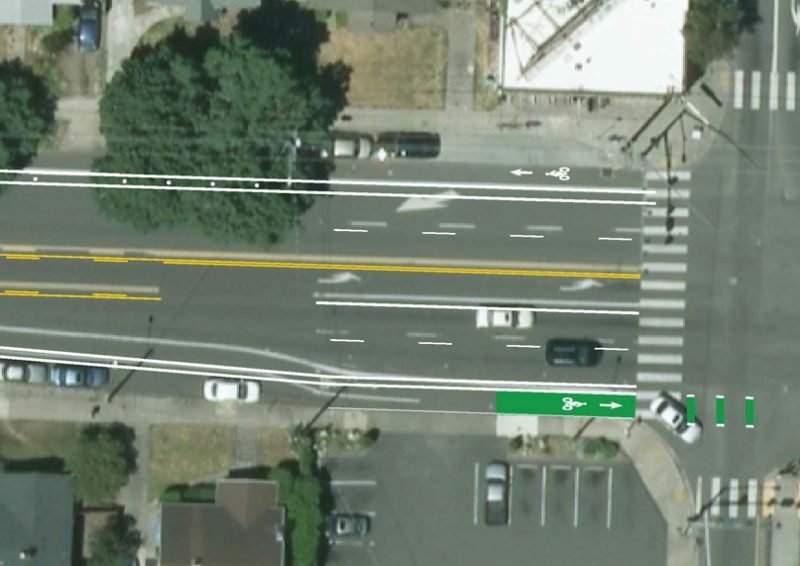 Narrowing the traffic lanes is a big plus – it’s nice to see PBOT is finally narrowing lanes to fit the speed limit, after exploring all the other possibilities first for the past 30-60 years. The smaller number of parking spaces will allow for delivery trucks to park between traffic lanes and bike lanes, rather than double-park in traffic or park in the middle of the bike lanes. When did you leave Portland? Because, 10-foot travel lanes have been the standard for about 20 years. Sorry, but the PBOT “standard” is 11 feet, especially when they repaved 122nd and outer Glisan within the past 7 years, and more recently Willamette and Naito north of Broadway. 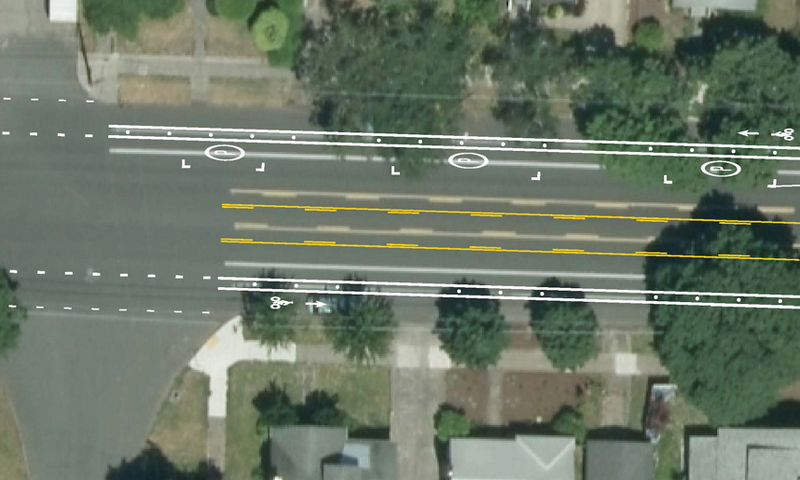 Occasionally I’ll see 10.5 from PBOT, but rarely 10.0; the federal minimum is 9 feet, which may be already used on parts of Foster and Hawthorne. Downtown streets tend to be 11 feet, and up to 13 or 14 on the right gutter of several streets around town, including outer Stark, the site of so many recent deaths. Tell me, what are the official lane dimensions of Division between 112th and 148th? 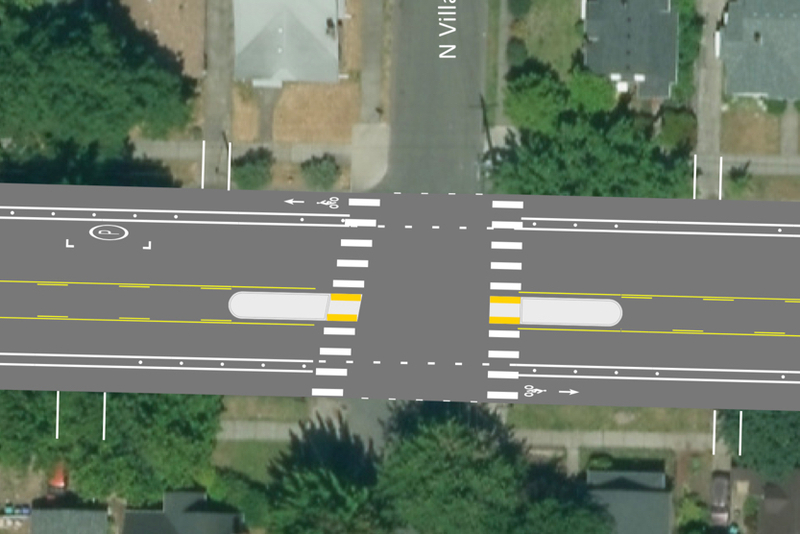 PBOT is planning to restripe Greeley with 10.5′ inner lanes and 12′ and 13′ outer lanes!